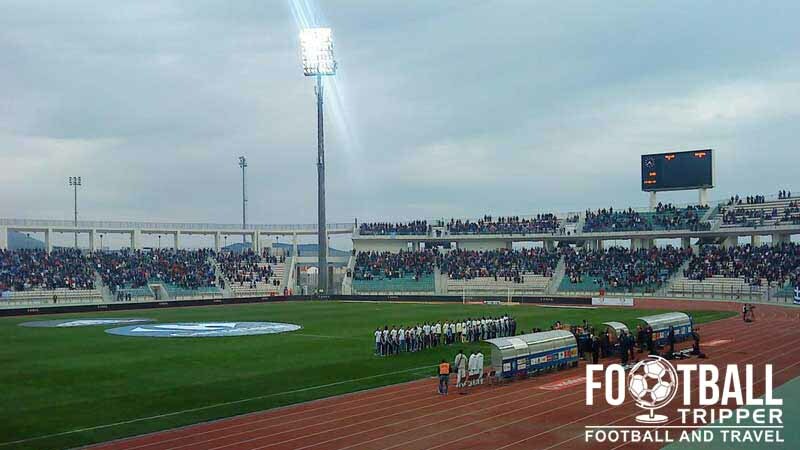 Panthessaliko Stadium is a 2004 constructed stadium located in the port city of Volos within the region of Thessaly. Opened in time for the 2004 Summer Olympics, the 22,700 capacity ground is home to not one but two Greek football teams: Olympiacos Volou 1937 F.C and Niki Volos F.C. 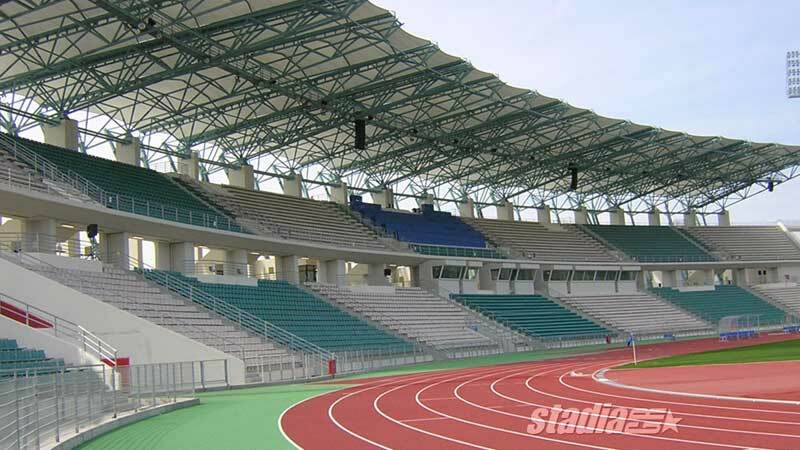 Constructed at a cost of €50 million, Panthessaliko Stadium first opened on 30th July 2004 where it hosted football matches of the 2004 Summer Olympic Games which was held in Athens. One of six venues used for the competition, the ground hosted four group matches including a memorable game between Japan and Italy which ended in 3-2. Although Panthessaliko’s capacity was set at 21,000 during the Olympics it appears as if the match between Greece and Mexico on 17th August 2004 exceeded this figure by around 600 seats. The record attendance of 21,597 from this match has subsequently yet to be beaten. Designed by Hasapis, Sargentis & associates, the stadium is regarded as one of the most original multi-purpose sports grounds in Greece as each stand takes on unique dimensions giving the ground a slightly askew appearance despite the uniformity of the concrete exterior. If any Greek Football Trippers happen to have a stadium map or seating plan of Panthessaliko Stadium then please let us know! 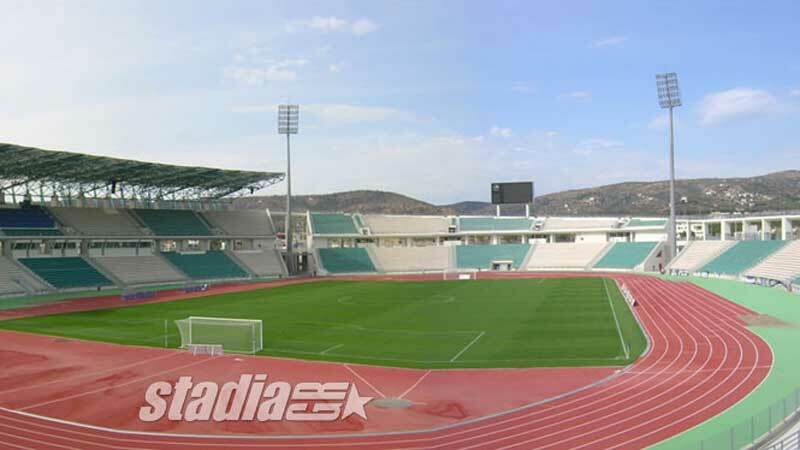 Panthessaliko Stadium is comprised of four stands: North, East, South and West. Similarly to the seating plan, if anyone of our readers knows where the visiting supporters are housed then please get in touch so we can update this section. It doesn’t appear as if there is a permanent fan shop of either Niki Volos F.C or Olympiacos Volou at Panthessaliko Stadium. As it’s municipally owned this doesn’t exactly come as a surprise. We can’t find anything on the web which suggests tours of the stadium or sports complex are available. Very few clubs sell football tickets online which works in the favour of Football Trippers as you can instead pick them before kick-off at the ground on matchdays. Don’t expect to pay much more than €15.00 for a decent seat which is centrally located. 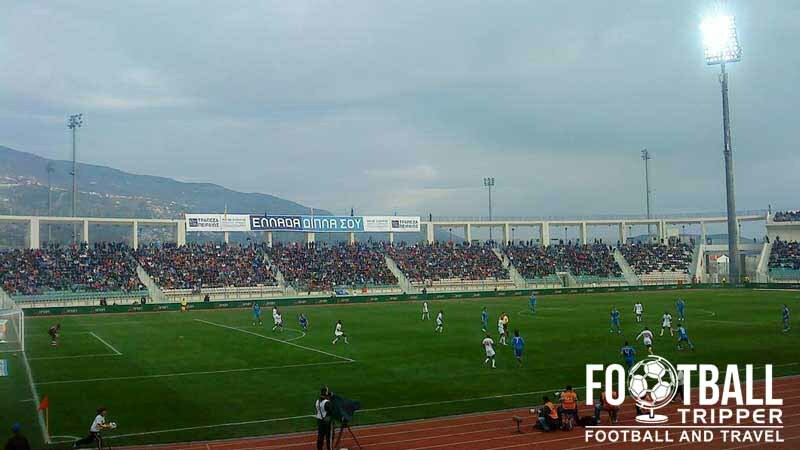 Panthessaliko Stadium is situated on the outskirts of town approximately 2.5 km north of Nea Ionia’s central area. Most Football Trippers should be able to walk to the ground in just over 20 minutes however it does depend on your starting location. Although there appears to be a mid-sized car park at Panthessaliko Stadium the exact parking arrangements on matchdays are unclear. Volos Railway Station (Βόλος) is situated within the heart of Nea Ionia an estimated 3.2km south of Stadio Panthessaliko. Another look at the stadium’s exterior and towering floodlights. From the city centre you can reportedly catch bus number 1 to within 500 metres from the stadium. The closest major airport appears to be Nea Anchialos National Airport which is around 32 km south of Volos anticlockwise around the Pagasetic Gulf. Hotel Anastasia is a good bridge between Panthessaliko Stadium and the railway station with the majority of accommodation options to be found in the Analipsi suburb which overlooks the harbour. Here there is the likes of Hotel Electra, Hotel Nefeli and Aegli Pallas Hotel Volos.